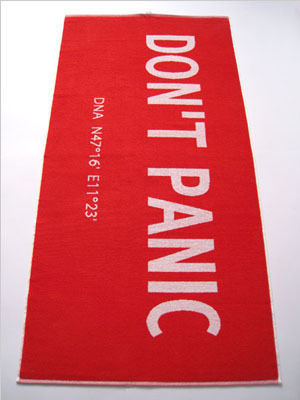 The DON'T PANIC Towel Shop sells just one product, a towel as a tribute to the author Douglas Adams and his ‘Hitchhiker's Guide to the Galaxy’. DON'T PANIC - Here you get the towels. The towel is in the classic size of a bath towel: 140 x 70 cm. The typeset is woven. The difference is just the colour. The rear side is mirrored (colurs and typeset). The towels are produced in high quality, like it is normal done for business use as hotels. The price is 37,90 Euro + costs for handling and shipping. Get one and carry it with you in honour. Since 2001, on may, the 25th, hitchhiker’s, fans + enthusiasts of D. Adams are celebrating the Towel Day, by carrying a towel with them. A few days after Douglas Adams died on the may, 11th 2001 D Clyde Williamson proposed to invent that day, as a tribute to the author of 'The Hitchhiker's Guide to the Galaxy'. In 2005 I was as artist in residence in Innsbruck, Austria. I worked on a project called: 'The Physcal HoT Spot'. A sound installation which refers in one part to D. Adams. For the design of the exhibition space i printed the first collection of ten DON'T PANIC towels. Beside the smart advice DON'T PANIC i added the initials of Douglas Noel Adams, DNA and the GPS data of the city Innsbruck. Once D. Adams had the idea for the Hitchhiker's Guide to the Galaxy here in town. More information about the Towel Day on wikipedia.